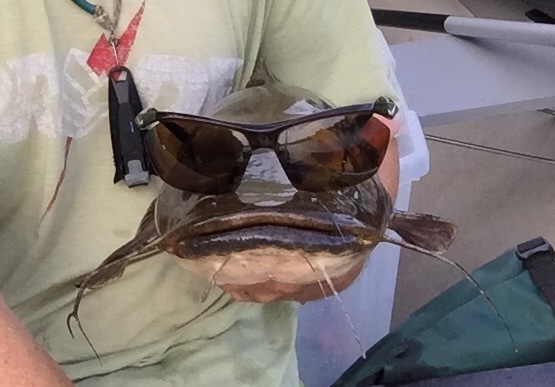 Fishing is a funny activity – funny peculiar, not funny haha. Although it is a game of problem solving, we often handcuff ourselves with misconceptions or hesitations. It’s usually a fixation on a certain lure, or bait, or “spot” that holds us back. 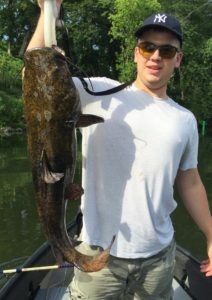 A 25 pound flathead from a southern honey hole. 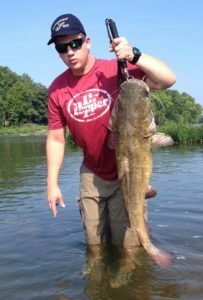 Years ago, I took a road trip to fish with a guide “down south” for flathead catfish. I learned a lot that day. I have returned to that same water a few times guideless, and always had success. More importantly, I always enjoyed the process. Simultaneously, I had been curious about a population of flatheads closer to home, but I never wet a line. 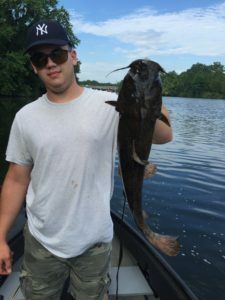 Why did I drive hours past flatheads to catch flatheads? The only answer I can give is; I didn’t know where to start, or so I thought. I had handcuffed myself with hesitation. I had confidence, but only in one spot. Well, I finally took the first step. I picked a likely stretch of river, took what I had learned fishing for “southern” flatheads, and made a few adjustments to fit this “northern” river. We had reasonable success right out of the blocks. That first step has opened a whole new fishery to my disposal – a new local species, a new water, and new set of fishing puzzles to solve. This single digit cat broke the flathead ice for us. This 16# was big fish of the day and a good way to close the first outing on new water.